Oftentimes when driving cattle, a cowboy is lulled into a sense of calmness by the creaking of his saddle and the constant sound of hoof beats on the trail. But it is not uncommon in the Southwest for large thunderheads to creep up unnoticed in the desert sky. 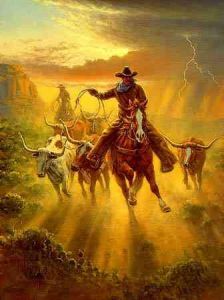 These men and their longhorns have been shaken by a loud bolt of lightening, spooking the cattle. In order to stop a stampede, the lead steer must be caught and turned so the others will follow suit. As the dust flies, the chase is on and the pursuit is certainly "Fast and Furious."